Normal change interval is 25 hours or every season. Changing it every year just makes life simple because I don't have to remember if I changed it the year before or not. The RY34426 uses a Champion RY4C spark plug gapped at 0.025 inches. Disconnecting the spark plug wire is an important safety measure before starting to work on small engines. It's usually one of the first things I do when tuning up engines after draining the old oil but this year I decided to keep the same spark plug in to see how well the engine ran with Royal Purple synthetic oil. Using a spark plug socket wrench I removed the spark plug, checked to make sure it wasn't damaged or too dirty and checked the gap. Everything looked fine so I screwed it back in. 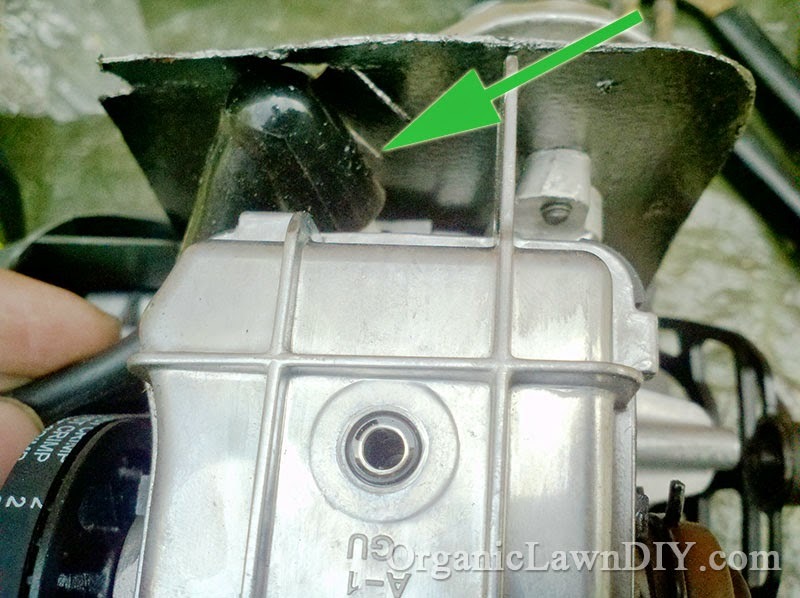 To get to the spark plug you first need to remove the top plastic engine cover using a T20 Torx screwdriver on a single screw on the top of the motor cover. You'll find the spark plug underneath between the muffler and cam cover. Next, it's time to check the rocker arm clearance. This needs to be done every 25 hours or every year, whichever comes first. 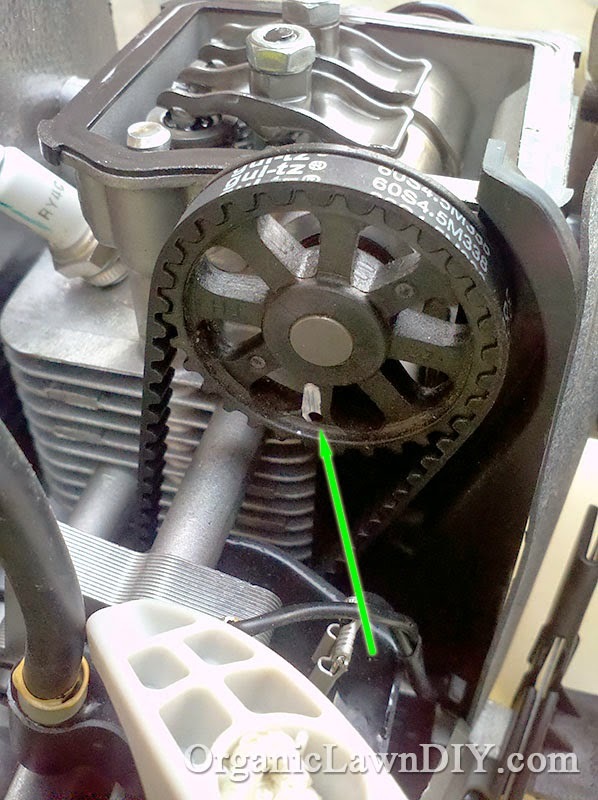 Remove the screw in the middle of the cam cover using a Torx screwdriver to expose the rocker arms and cam shaft. 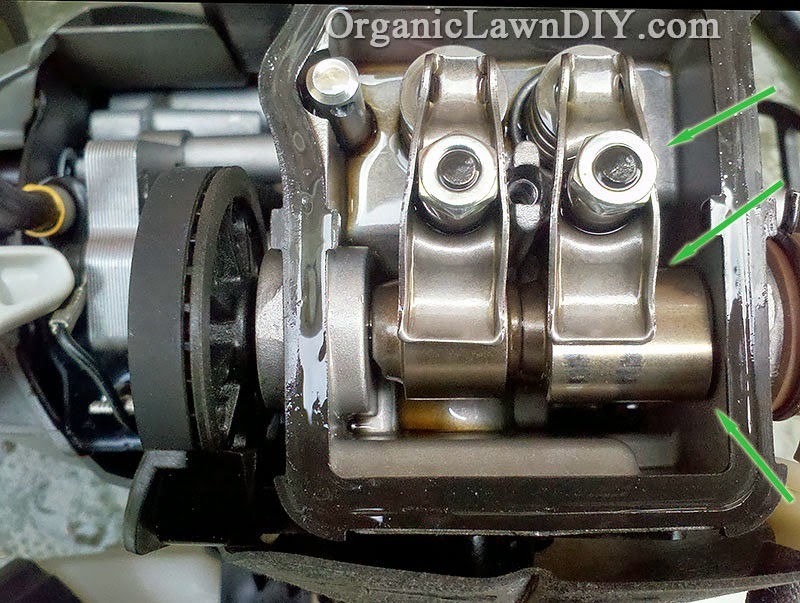 check the gap between the rocker arm and camshaft using feeler gauges. I picked up the Lisle 68100 Deluxe Feeler Gauge because I knew I'd be able to use it for the rocker arms as well as checking gaps on different spark plugs. The camshaft gear has a hole on one of the spokes. On mine there's also a white mark. Pull on the starter rope slowly until you get the hole at the 6 o'clock position. You did remove the spark plug wire right? Okay. As you pull the rope slowly you'll feel some resistance as it goes through the compression cycle. At the end of that compression cycle is when the hole is at the bottom. The picture below has 3 arrows, retaining nut and adjustment nut on top, followed by rocker arm in the middle and finally the camshaft in the middle. Slide the feeler gauge underneath the rocker arm to check the clearance. The manual for my RY34426 says the 0.008 inch feeler gauge should not slide between the rocker arms and cam lobes, it should be held tight but the 0.006 feeler gauge should slide through with a little resistance. If the clearance is off you need to hold the adjustment nut in place with a thin wrench and loosen the retaining nut with another wrench. Once the retaining nut is loose, hold the retaining nut while you tighten or loosen the adjustment nut until you get the required clearance. When done, hold the adjustment nut and tighten the retaining nut. 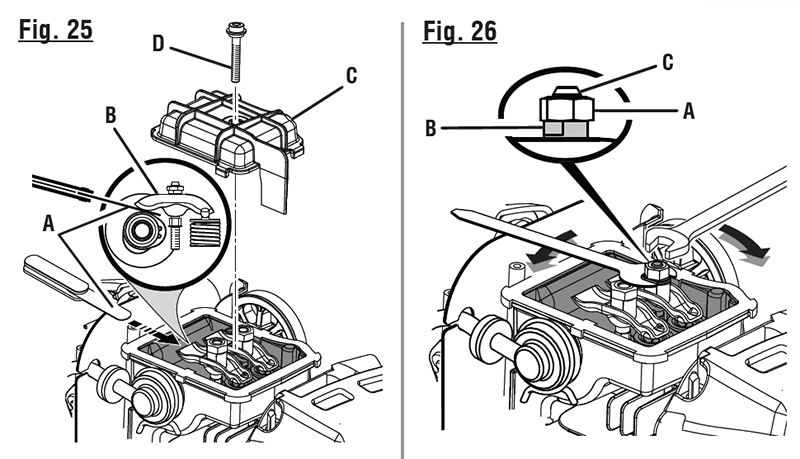 These diagrams from the manual give a better view than I could get with only 2 greasy hands. When you're done making adjustments reassemble the motor. Remove the foam filter and wash it in soap and water then let it air dry. Once dry, spray it lightly with some oil then reinsert. Follow up by draining and replacing the oil, check all connections, screws, nuts to make sure everything is in proper working order. Replace any damaged parts.